The Trinity College community is vibrant, friendly and supportive. One of our key goals is to foster a co-operative relationship with and promote the College to all members of the College community – be they students, staff or parents, and we encourage their involvement in many ways. In addition, we realise that the College's role doesn't stop at the end of the school day or the conclusion of a student's education, and after school care, old scholars and a Parents and Friends Association are important aspects of our community life. Do you have the characteristics to become a member of the Trinity College Board? Find out the key qualities and pre-requites of an ideal Board member here. 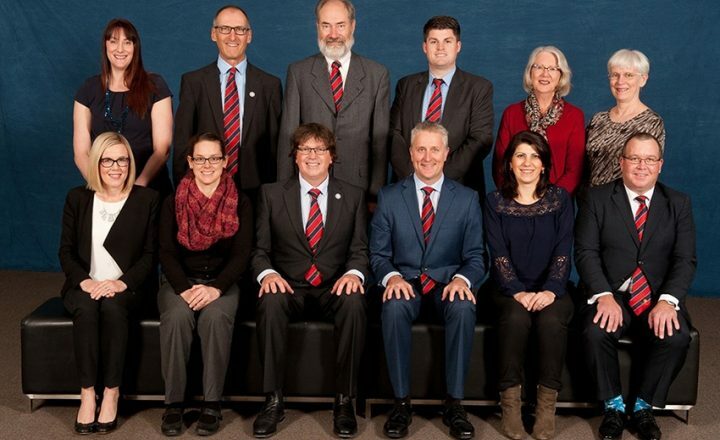 2017-18 Trinity College Board, back row L to R: Mrs K Aplin, Mr R Johnstone (Treasurer), Mr D Russell, Mr C Maiolo (Secretary), Mrs W Dimmock, Mrs H Clarke, front row L to R: Mrs K Pizzino, Mrs E MacGillivray (Vice Chair), Dr K Heath (Chair), Mr N Hately (Head), Mrs G Pelle, Mr B Collings Absent: The Ven B O'Donovan and The Rev Canon S Bailey. Annual Reports and Audited Financial Statements will be presented to the meeting. Elections will take place for three vacancies for a two year term on the College Board. Download a copy of the 2019 Annual Report here. Only financial members will be able to vote at the meeting or nominate for a position on the Governing Board. For those who are not already financial members, membership ($2.00) must be paid by Monday 8 April 2019 (28 days prior to AGM). Persons who are eligible to be members of the College can pay their membership subscription in person at Central Administration or school offices. Musical items and refreshments will also be a part of the evening’s programme. The Trinity College Board takes the view that any public reporting of school results should be considered in light of the constitutional aims of the College and the nature of education that those constitutional aims encourage. Trinity College constitutional aims encourage a holistic education striving for excellence within a caring and Christian environment. The College measures its success in a variety of ways consistent with the constitutional aims including its ability to affect the lives of students positively: intellectually, physically, spiritually, culturally (eg aesthetically and musically), socially; and in ways that encourage each child to appreciate the joy of living. Trinity College is open to all. We enrol students with a range of academic abilities and have a major intake of students at North and South in Years 7 and 8 and at TCS at Year 11 and Year 12. Maintaining open and comprehensive enrolment is part of the mission of Trinity College and our success in providing an excellent education to such a diverse range of students is something we are very proud of. We treasure our ability to improve students who find their academic programme difficult, just as we do those who are gifted academics. It is student improvement fed by a desire to do their best that matters to the College and should drive all students, regardless of their individual ability or final results. The College's role is to support all students to achieve their best academically by attending to their weaknesses and encouraging their strengths. The College does not take this support lightly and has strong structures and strategic initiatives in place to improve student outcomes continually. NAPLAN is one of many good assessment instruments that the College uses to help inform improvement. Schools at Trinity College examine data rigorously and use it in a sensible and reflective way to help improve teaching and learning. Our student academic data include NAPLAN, internal results, external competitions, ACER tests and SACE Stage 1 and Stage 2 results. We understand that when comparing our Trinity schools, academic results vary from school to school, from time to time, depending on a variety of factors including the nature of the student cohort. The important issue for the College is that information is deliberately considered and where matters under our control can be improved, it seeks to make such improvements. The Head of the College, Principal of each school and the Director of Studies will willingly discuss with you how data is used at the school and College level. Parents wishing to seek clarification about information posted on the ACARA myschool website are encouraged to communicate directly with their school. Any prospective parent wishing to receive a more comprehensive analysis of the College's teaching and learning programmes and their associated assessment and reporting procedures is encouraged to communicate with the Trinity College office. The Head of the College would welcome the opportunity to discuss matters with you.